But, thankfully, you don't fart if you wear them more (that'd be an interesting experiment to conduct though). So anyway. I hit Miranda Myer today and somehow managed to pick the perfect pair of jeans. You know that moment when you touch a piece of clothing and your heart seems to race and the whole day just suddenly got better? Your very existence is justified; it's magic and there's no other way to describe it? No? Okay, it's probably just me then. But anyway. That is how I felt (cheesy, I know) when I touched this pair of jeans hanging from the Cooper St stand in Myer. Let me clarify: they are NOT Cooper St jeans, they are Ninedays, a brand which my cloistered little head has never of, but WHO CARES. They're perfect. AND. They were in my size. If I could give awards for shopping moments of the year, THIS WOULD BE IT. They're dark (I dislike light-coloured jeans with a passion, but that's just me). They're slinky. They're stretchy and comfortable and I DON'T CARE if skinny jeans are "going out", nor that summer is coming in and it will therefore be too hot to wear jeans. The fact is, I love skinny jeans (everything else makes me look as FAT as a heifer) and I LOVE THESE JEANS. 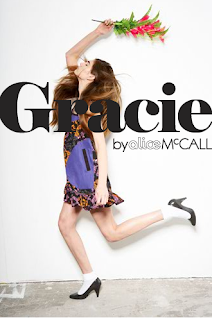 New: Gracie by Alice McCall at General Pants Co. They only had one stand at Miranda General Pants Co today. I love Alice McCall and all (rhyme unintended, seriously!) but I wasn't that impressed. It's cute, for sure, but if I had to sum it up in one word I'd say it's... okay. Or maybe they only seemed that way after my brilliant stop-the-press-i'm-falling-in-love moment with the jeans. Sorry!